Try this spin on an classic Mexican favorite made Asian style that can be served as an appetizer or a meal. Makes about 40, depending on how full they are filled. Make Wasabi Mayonnaise if using the homemade kind and refrigerate. In a large skillet heat the sesame oil over medium high heat. Add chicken and cook for a couple of minutes. Then add red cabbage, celery and carrots. Stir often. Once all veggies have a vibrant color, add bean sprouts and soy sauce. Mix thoroughly and let sit. Spray cookie sheet with non-stick cooking spray. Place as many wontons out on your counter and place a tablespoon of the mixture onto each wonton. Please note that wonton wrappers can easily dry or can stick, so speed is important or use a wet paper towel to aid in preparation. Spread mixture in a straight line from one corner to the opposite corner of wonton. Roll as tight as you can, going on the diagonal. Place the side where the corner of the diagonal meets the rolled portion on the bottom when placing onto the cookie sheet so that it does not unwrap. Once all wontons are rolled and on the cookie sheet, spray generously with non-stick spray. Place on lower rack of a preheated oven at 375 degrees for 15 minutes or until wontons are crispy and golden brown. 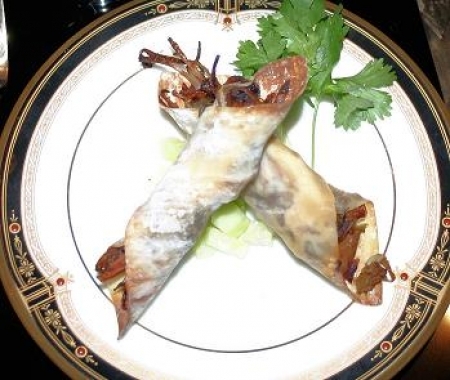 Serve with dipping sauces for the ultimate Asian taquito experience! A plum wine is perfect try Hauteur plum wine or your favorite brand or try Tsingtao, Asahi or Sapporo.